After graduating from West Virginia University with a degree in Athletic Training and Education, Chris pursued Physical Therapy at Howard University in Washington DC and later she completed her Masters at Howard University. Chris has over 15 years of human physical therapy and sports medicine experience with emphasis on manual therapy and biomechanics. Her interest in Canine Rehabilitation began in 2000 when her own dog, Cooper, underwent a caudal cruciate repair. The surgeon recommended swimming for rehab but had no other suggestions. It just didn’t make sense that human patients receive a very specific rehabilitation program after a similar surgery, but for a dog the rehab was simply swimming. Chris began utilizing her human physical therapy knowledge and manual skills to address the post surgical needs in her dog – lack of flexibility, decreased strength, and poor neuromuscular control. The results were impressive, Cooper regained full range of motion, strength, and was back to chasing squirrels in no time. This experience spurred a desire to learn more about canine rehabilitation and the specific mechanics and needs of dogs. She began coursework through the University of Tennessee certification program in canine rehabilitation. Her clinical residency was spent here at MASH and she earned her Certified Canine Rehabilitation Practitioner credentials in December 2007. Now with 8 years of Canine Rehabilitation experience, she has opened Canine Comeback Rehabilitation to serve the rehabilitation needs of dogs big and small, athletic and elderly, for the fullest dog life possible. Juliana Frenkil has lived the majority of her life in and around Baltimore, Maryland. Although she was an English and Fine Arts double major in college, jobs at local veterinarians and a thoroughbred breeding farm peaked her interest in the field of veterinary medicine. Juliana spent 11 years working in an emergency animal hospital as a Registered Veterinary Technician, and later working in the capacity of the hospital’s general manager. During this period, she also continued voluntary work at a non-profit wildlife sanctuary, where she obtained her license to rehabilitate birds of prey. CHESARDA, a Maryland-based canine search and rescue group approached Juliana for volunteer work. She then became an emergency field technician for the team in case of injury to any of the working dogs. She taught emergency canine first aid and CPR to police, firemen, and SAR handlers through CHESARDA and Carroll Community College. In 2001, Juliana joined the team at Chesapeake Veterinary Surgical Specialists (CVSS), working as a surgical technician. Caring for patients post operatively sparked her interest in canine rehabilitation and eventually she approached CVSS with the idea of adding these services to enhance the patients post-operative recovery. Juliana attended the Canine Rehabilitation Institute, and received her degree as a Certified Canine Rehabilitative Assistant. Working in this capacity for CVSS was very rewarding, and she divided her time in this realm and as a surgical nurse. Juliana is currently in the process of relocation to Annapolis, and hopes that very soon this will be on a permanent basis. She is the proud mother to one daughter. In her free time, Juliana enjoys anything that involves the outdoors, particularly hiking, kayaking, and swimming. She also is excited about discovering whether or not she has retained her artistic talent. Although both of her wonderful German Shepherds have passed, she looks forward to adopting a rescue dog in the future. Juliana currently owns a rescued cat, Gryphon. Juliana is elated to be a part of the MASH team, and is looking forward to growing the rehabilitative practice for the company. Drew Fisher is MASH’s Rehabilitation Canine Aquatics Technician. Drew grew up in Huntingtown, MD where he originally started working in the veterinarian field at the age of 14 as a Kennel Assistant and Technician. He went on to pursue a career in Healthcare Medical administration at UMD. After several years in the human medical field, he went back to his original passion in the veterinarian field and started a career in Canine Aquatic Rehabilitation. 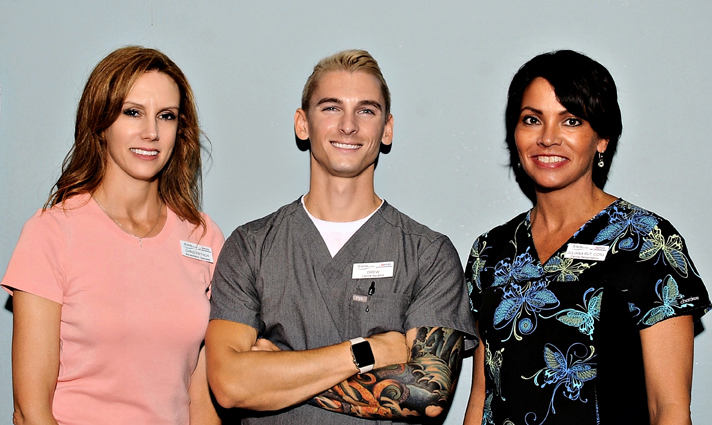 He joined the MASH REHAB team in 2012, and is currently finishing his veterinarian canine rehabilitation certification. He currently lives in Washington, DC with his three beloved dogs, two French Bulldogs, Hank, and Stewie, and a Boxer mix, Princess.